2 Catered Chalets and 4 Half Board Hotels. 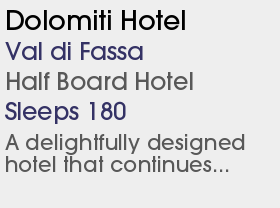 WEsay A small but well established resort offering direct links onto the Sella Ronda circuit. The apres-ski has plenty to offer. The beautiful broad sunny Val di Fassa is one of the treasures of the spectacular Dolomites area of north-east Italy. Arguably the most beautiful mountain range in Europe the pink and orange hues of the craggy peaks change colour from daybreak to twilight. The Dolomites area is the largest in the world, with over 1200km of slopes. 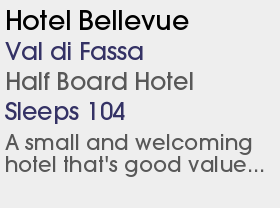 Val di Fassa is actually made up of several smaller resorts, mostly lift linked. Once part of the South Tyrol the influence is obviously Austrian although the atmosphere is definitely Italian. Beginners will find that there some good nursery slopes in whatever resort they choose but Canazei is where the best ones are. Intermediates will have the whole area at their feet and since most of the pistes are red there is plenty of opportunity to cruise and enjoy the entire Stella Ronda circuit. Advanced skiers will also find plenty to challenge them here with numerous blacks and a great variety of scenic off piste. There are also world championship downhill courses in Val Gardena and La Villa to try out. For those wishing to sample the apres ski there are plenty of jolly, unpretentious bars, where the atmosphere is always cheerful and convivial. At Arabba, the ancient double chair lift from the village to Portados at mid-mountain is being upgraded to a n 8-seater gondola. This joins with a higher fast chair that gets you en route to Passo Pordoi, bettering the traffic flow on the clockwise Sella Ronda circuit. 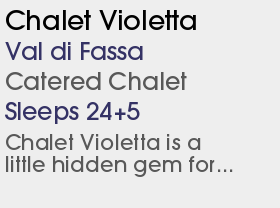 In a huge upgrade, the Gran Paradiso button lift at Piz Sella is being exchanged for a covered 8-seater with heated seats Italys first, supposedly ; seats are in an eye catching blue, you ll be pleased to hear. The double chair lift Comici 2 at Piz Sella was replaced by a six-seater chair. Nearby, a brand new black piste Paprika was created as a variant of the existing Seef. The La Fraina quad chair above San Cassiano was replaced by a six-pack. 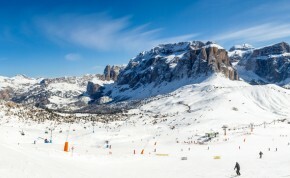 Wide network of linked slopes on the Sella Ronda - suits intermediates well.